Christmas, Christmas, Christmas! (Who really needs more Christmas crafts? We do!) December is one of my favorite months of the year because I love the Christmas holiday. 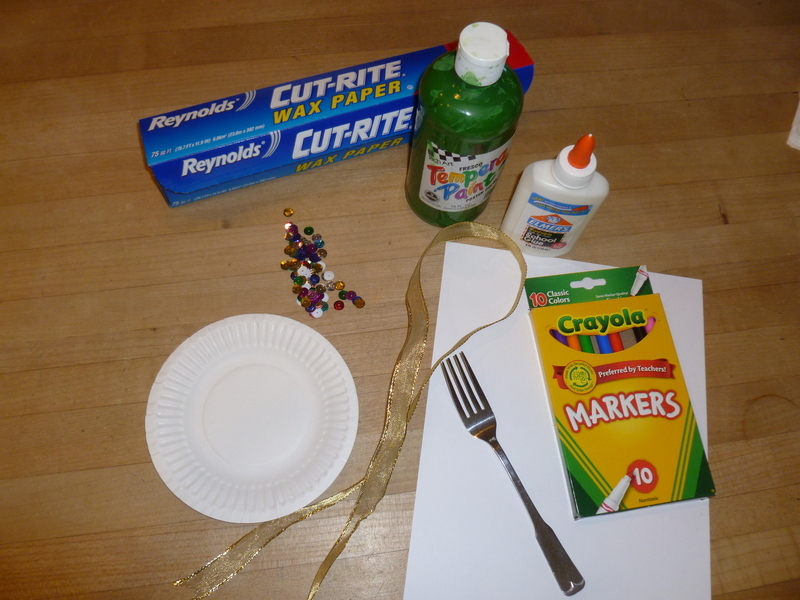 Today we’ll talk a little about the history of Christmas and then make a wreath with a fork, paint, and sequins. We usually describe the first Christmas as the event in the City of Bethlehem when Jesus – God’s Son – was born. Fulfilling Biblical Old Testament prophecy, Jesus came to earth as a baby, was born in a Bethlehem stables, and laid in a manger. Angels announced His birth to nearby shepherds, and later wise men from the east came to see Him. 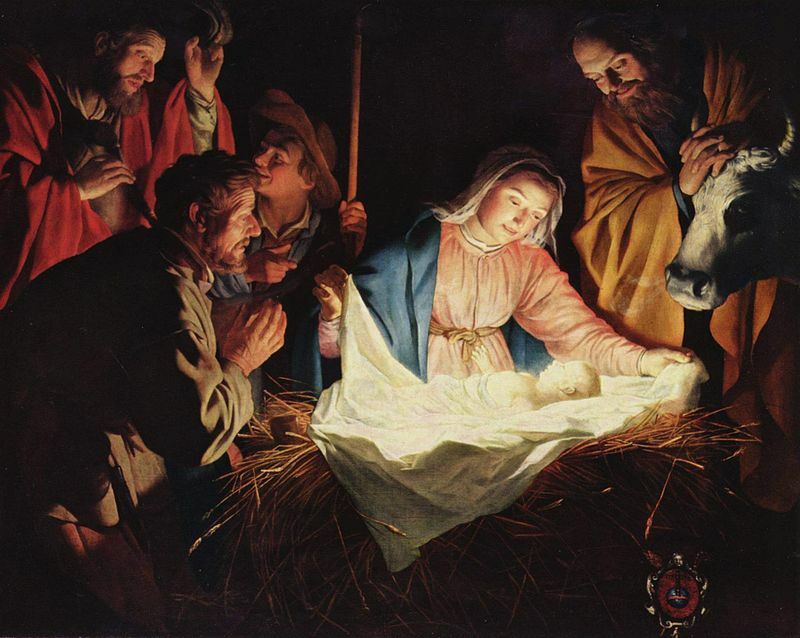 (Luke 2, Matthew 2) But it wasn’t until a long while after Christ’s birth that His birthday started to be celebrated…and His birthday probably wasn’t even in December. December became the month of celebration because some of the religious folks decided to “Christianize” a pagan holiday. You see, the Romans had a feast for one of their false gods in December; it was called Saturnalia and was celebrated with gift giving and red and green decorations. The Roman Church eventually took some of the Saturnalia traditions and combined them with some religious beliefs and called it “Christmas” – trying to make Christ’s birth the focus of their new holiday. Some of our favorite Christmas traditions also have roots from the past. Did you know that Martin Luther – the Protestant reformer – was said to have cut one of the first Christmas trees for his children? And a few centuries later Queen Victoria of England popularized Christmas trees in England and America. Do you like the poinsettia flowers? Those were traditionally used in Mexican celebrations of Christmas. One of my favorite Christmas decorations is a wreath. Wreaths have been used for centuries to display the beautiful, natural woodland plants and to welcome guests for celebrations. Today, I’ll share an idea for making a wreath of your own! Begin by tracing around the pot’s lid on your cardstock to make a perfect circle. Spread some wax paper to keep the table clean. 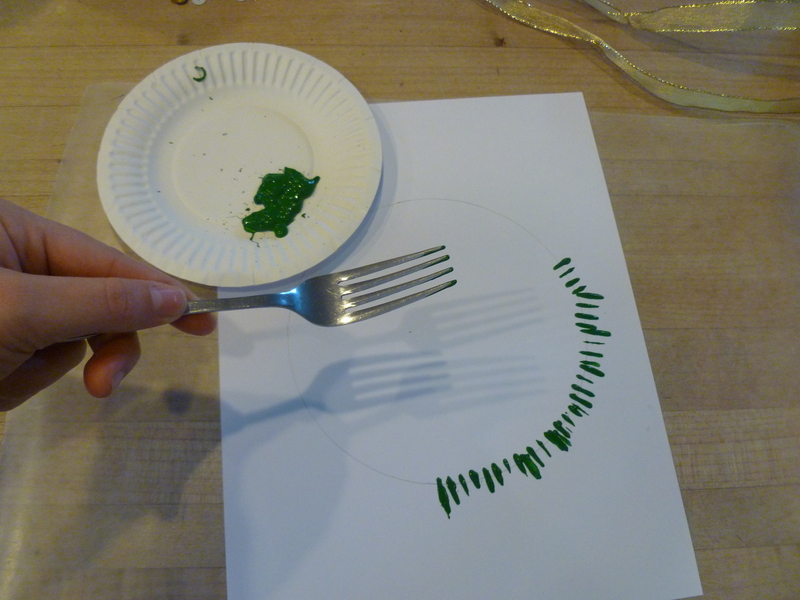 Next, put some green paint on the paper plat and dip the flat part of the fork in the paint. Press the fork onto the paper, using the circle to guide you. (See photo). 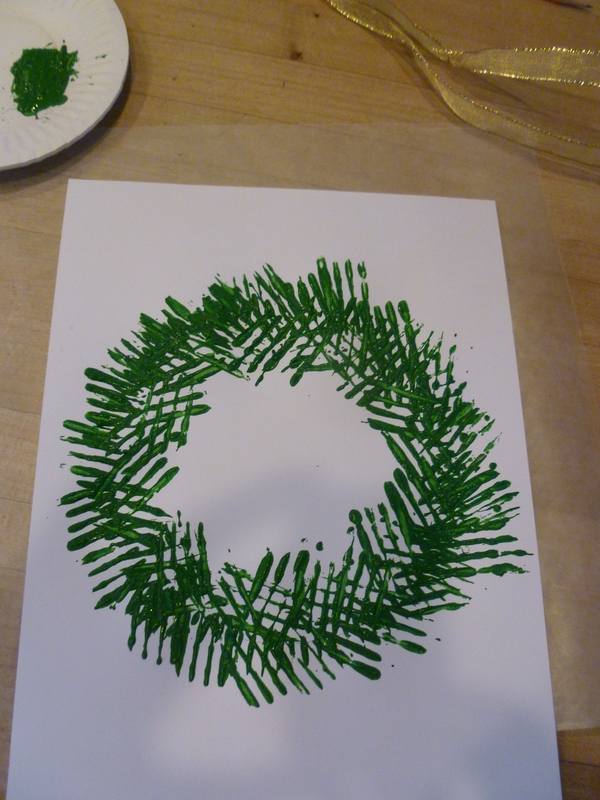 Continue “fork painting” until your wreath is full and even. Let the paint dry for a few hours. Tie the ribbon into a pretty bow and decide how it will be placed on the wreath. I put mine at the top, but it really could go anywhere you like. Glue in place. 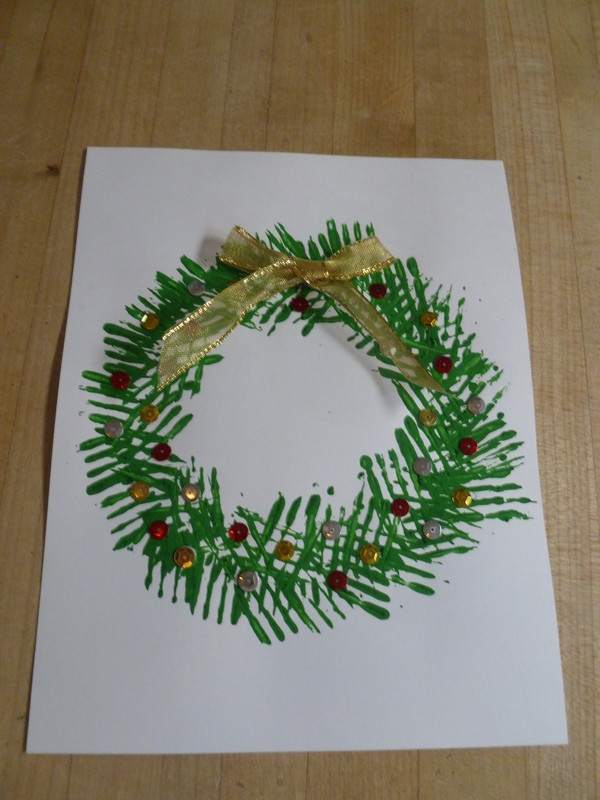 Glue sequins on the “greenery” of your wreath. Let it dry for a while. Next A New Look At CW Clothing – What Did Betsy Westmore Really Wear? What a fantastic idea! Pity we just had our last playgroup session today. The kids would have loved this craft! Might have to do it myself instead!